Many people know and understand the negative effects of sinus and nasal congestion. But what most of them are not aware of are the positive effects of employing the best neti pot to alleviate their condition. Such as the Aromatic Salt Premium Ceramic Neti Pot. Using it is quite comfortable and easy. The same applies to cleaning it. The tapered design of the spout is perfect for the nostril. And the solid handle enables complete, thorough cleaning. Its dishwasher-safe and lead-free properties are also a part of the picture. So there’s no doubt that you’re looking at the top pick. But if your preferences are slightly on the unconventional side, here’s what you might like. The Yogi’s NoseBuddy Ultimate Neti Pot. The combination of large volume and unique construction is the most appealing aspect. Both contribute to better water flow. It has a transparent design so you can actually see the level of water remaining. Built using durable, light, BPA-free polypropylene plastic, this pot, with an invaluable measuring spoon, beats the others in terms of functionality. As for affordability, you might not find anything better than the Himalayan Chandra Porcelain Neti Pot. The product offers an excellent combination of low price and high performance. It does an excellent job at simplifying the task of nasal irrigation. Thanks to the distinctive shape and lotus design. Such a structure hands out optimal flow to cleanse sinus passages like no other. No wonder it’s recommended by many pharmacists and doctors worldwide! The concept of nasal wash has been around for more than 5,000 years? In fact, it plays a significant part in practicing yoga, meditation, and mindfulness. Many yogi masters have taught the art of practicing yoga along with nasal cleansing that demands the use of water, milk, and other solutions to nourish and restore the body before meditating. A neti pot, however, was given its name much later than its invention. In order to improve the overall quality of spiritual practices, the neti pot was designed as a ceramic pot. Due to the growth of such a holistic lifestyle, the use of other materials such as stainless steel, copper, and plastic become prominent. You will even find eco-friendly bioplastic as one of the best materials used for designing a neti pot. So you can say that using this vessel is probably as important as using a high-quality air purifier to keep the bad germs out. With the increase in air pollution and other environmental allergens, chemicals, and bacteria, the use of a neti pot has become more necessary than ever. People with well-irrigated nasal cavities are less likely to catch allergies or infections than those who don’t use any sort of saline nasal irrigation solution. Using this vessel, compared to modern medicine, has more holistic health benefits with no side-effects. So rinsing your nasal passages, on a regular basis, is a good way to revitalize your upper respiratory system. It also helps clear out mucus and inflammation in the nasal and sinus cavities. While there are many ways to clear your nasal and sinus cavities, is one better than the other? A saline nasal spray, for example, uses a hypertonic that’s much saltier than your body’s salt levels, with water. Some nasal sprays also use plain salt water, the same as a neti pot, to do away with allergens and mucus. Only with a nasal spray, you have to spray the saline solution up your nostril and let gravity drain the solution back down. However, the hypertonic in a saline nasal spray is known for causing dry skin, so using too much of the spray is prohibited. There is not much difference between a neti pot and a nasal spray. Both use little to no chemicals to clear up the nasal cavities and sinuses. And you can use both in the shower or above the sink. In the competition between a neti pot and nasal spray, both are convenient and efficient vessels to use for saline nasal irrigation. However, a neti pot is more effective at relieving the sinus and nasal cavities than a spray. This is due to the warm water intensity of the former that makes it the class-apart choice for most people. Based on the most common and sought-for nasal irrigation preferences, the best way to pick out a good neti pot is after considering its material and easy of use. The benefits of using a stainless steel vessel include long-lasting durability, sturdy build, and comfortable grip ability. Stainless steel is often easy to clean, hygienic, and has a clinical element to it. If you want something that is available in varied sizes and is lightweight enough to hold 16 ounces of saline solution, go for this choice. The only drawback to using stainless steel is that it’s prone to rust, unless replaced often. Ceramic pots offer easy pouring abilities and are softer to touch, despite their heavy build. They are often used for a long time, given that you take care of them. The drawback to using ceramic is that they’re easy to break or crack. So you need to handle them carefully at all times. The good thing about using plastic pots is that they’re hard to break. With durability and portability at their side, plastic vessels are essential go-to tool for travelers. However, plastic can come in many forms including the kind that’s harmful for the environment. That said, bad plastic vessels can emit a strange smell after consistent use. The best part about using copper is that they’re malleable. Which means you will find copper pots of all sizes and shapes, based on your preferences. Copper is an unbreakable and clinically-efficient material to use. Despite its dull looking appearance, it is a good vessel to have. All these materials offer anti-bacterial properties and are unbreakable to begin with. Cleanliness/Safety: Using a neti pot may be simple for everyone. However, it’s important to consider that a clogged or dusty neti pot can do you more harm than good. Safety or cleanliness is very important. You need to inspect your vessel for how clean and accessible it is. Based on the customer feedback we found on numerous products, a thoroughly clean neti pot is the top priority. Hollow handles or pouts can catch dust mites and other microbes easily. So look for any such nooks in your vessel before finalizing your purchase. The same applies to whether it’s microwave or dishwasher friendly for ease of use. According to research, consulting an ENT specialist or any other healthcare specialist about using the right nasal irrigation is necessary. This will you know for sure whether this kind of nasal irrigation treatment is good for you. When using a neti pot for the first time, you need to take into consideration 2 key factors: hygiene and water. The main concern for most nasal irrigation vessels is the presence of a common parasite known as Naegleria fowleri. This parasite is present in tap water, in exorbitant amounts, which may cause infections and causes allergies. This side-effects of inhaling this kind of parasite can be rare, however, it’s impactful enough for you to make sure you’re either using distilled or boiled water as a saline solution. Moving forward, another common concern for water-quality is the presence of amoeboflagellate in the water. However rare this element might in, it can cause allergies and infections as easily. This is commonly found during hotter climates and goes easily undetected through tap water. Boiling water or using distilled, sterile, or filtered water for a saline solution is ideal. Make sure you boil tap water for 3-5 minutes before use. This wipes out all kinds of waterborne bacteria and parasites from the water. According to studies, filtered water without the label “NSF 35” or “NSF 58,” aren’t safe for saline nasal irrigation use. So it’s critical to use the best faucet or under-sink water filters for this purpose. It’s not surprising that municipal water supply is brimming with all kinds of waterborne parasites and bacteria. So the chances of you getting an infection or respiratory condition or allergies is likely if you use a neti pot without filtering or boiling water. Especially when you use it on a regular basis. The best solution to avoiding such problems is using boiled water to help rinse and revitalize your sinuses. So even if the municipal water is contaminated, the heat kills of all germs and bacteria. Use freshly boiled water each time you use a neti pot. Storing boiled water in plastic bottles can lead to air contamination as the environmental pollutants in the air can easily get inside the boiled water. Buying a good air quality monitor to detect indoor air pollution is essential. This brings us to the second part of our discussion: hygiene. Cleaning your vessel is as important as making sure the water is safe to inhale. You can clean the vessel with warm water and soap as you use it. Another excellent way to make sure the vessel is sterilized is to let it air-dry in the microwave. This is because air-drying the vessel, without microwaving it, can attract all kinds of bacteria floating in the air. And if the vessel is still wet, it becomes a breeding ground for bacteria to thrive and hide. After drying the vessel, contain it in an airtight plastic bag. That is right after you sterilize it. If you’re using a neti pot 2-3 times a week, this may be a hassle for you, but it’s worth the effort as it keeps the vessel from getting contaminated. For most people, sterilizing a vessel part is an integral part of the use of it. Then you can use it for as long as you want and as many times as you want. The Aromatic Salt Premium Ceramic Neti Pot and congested nostrils don’t make a good pair. And that’s because the former is specifically crafted to get rid of the latter. In that case, you might go for the simple design of the vessel. Its tapered spout is smooth enough to fit the nostril quite comfortably. On top of that, the handle is more than just easy and convenient to hold. It keeps germs and contaminants away as well. Then there’s the 8-ounce capacity, which is exactly what you need to cleanse your nostrils, both of them. And without even a single refill! As for safety, lead content is zero. As for cleaning, it’s dishwasher-friendly. And as for durability, the product has a porcelain ceramic construction. So every major factor is well taken care of! What’s the negative feedback here? The only complaint, in this case, is the wide opening of the spout. As a result of which water tends to run down the lips instead of coming out into the nose. If there’s any highly recommended vessel on the current market, it’s none other than the Yogi’s NoseBuddy Ultimate Neti Pot. It gives you an efficient nostril rinse to get rid of congestion. The kind caused by sinus infections, common cold, and allergies. You can even use it to alleviate negative effects of flu, snoring, and asthma. But you know what; that’s not even the most attractive quality. The part that you might fall for is the unconventional, unique design. It’s transparent and made of lightweight, durable polypropylene plastic. The former allows you to see what’s inside, which means better cleaning too. And the latter implies that the vessel won’t break easily. What’s more is that this ultimate pick contains a large volume of liquid. This makes way for a complete, thorough rinse. It enables better liquid flow to your congested, irritated nostrils. Using and cleaning it are pretty easy tasks too. The weight of the little kettle is 120 grams only. That means you’ll have no worries carrying it around either. So you don’t need to travel with congested nostrils. Now here’s a feature that brings more comfort and convenience into the mix. This particular model comes with an invaluable measuring spoon. So you can create that perfect solution to calm your nasal passage. The Himalayan Chandra Porcelain Neti Pot is proof that you don’t need to empty your wallet to keep nasal discomfort at bay. This budget-friendly option performs just as well as the others when it comes to providing relief from sinus, allergies, nasal stuffiness, and cold. It cleanses the passage while also protecting it from negative effects of irritants and allergens. Now let’s talk about the excellent features of this model. The ceramic design consists of lead-free properties. That means the vessel is safe in terms of usability. Another remarkable design quality is the distinctive lotus shape. What such a structure does is make way for optimal cleansing liquid flow into the nasal area. In more practical terms, the size of the tiny yet useful appliance is the most exceptional thing. Its finger loop offers tons of comfort, apart from providing a solid grip. The well-designed nozzle is also a praiseworthy addition. There’s no need for you to tip the pot every time you want access to an optimally pressured stream. So to sum it up, it’s so smooth and curvy that it can nestle into the nasal passage without any discomfort or pain. Let me bring to your notice that the SinuCleanse Nasal Wash System was developed by a medical professional. A leading ENT physician by the name of Dr. Diane Heatley. Her goal was to help her patients find relief from nasal, allergy, and sinus symptoms. And that’s exactly what this product is capable of doing. 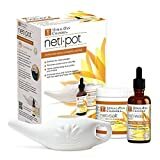 This clinically proven neti pot is a natural, healthy alternative to sprays, pills, and their many side effects. Safe and easy usability are inevitable with a vessel that’s so light in weight. So you don’t need to think twice before making yourself feel better with this thing. The fact that it’s built using plastic material indicates two important advantages. The first is that you can cleanse your nostrils even in your shower. And the second benefit comes in the form of exceptional damage resistance. In my opinion, that’s more than you could’ve asked for from such a lightweight option. Furthermore, the SinuCleanse Nasal Wash System has a see-through body. So you can find out the remaining volume of liquid without having to go the extra mile. That means using it on a daily basis is not only possible but extremely comfortable too. Sinus congestion, cold, and allergies demand quick relief. In that regard, nothing fits better than the HealthAndYoga Stainless Steel Neti Pot. The little kettle works like a wonder when it comes to alleviating blocked nostrils. So breathing like a normal person during such times is not something you have to wait for. Cleaning and maintaining the vessel are easy, quick tasks. The best thing to do is to feed it to your dishwasher. As for the elephant in the room, the unique stainless steel structure brings long-lasting value and durability to the table. The capacity of the container is also quite impressive. Large enough to hold as much as 16 ounces! That means complete, thorough cleanse without any interruptions. In that case, another notable feature is the solid, non-slipping handle. It makes holding the tiny appliance more convenient. As for the weight, the manufacturer leaves no room for error. Carrying it around is not a worry either. Additionally, you get an incredibly useful instruction manual and an invaluable fiber-designed storage bag. So it’s pointless giving rise to even a single doubt when dealing with such a model. The ComfyPot Beautiful Ceramic Neti Pot is the easiest to use. The design is not only beautiful, as the title suggests, but also comfortable. Cleaning the vessel to keep bacteria and germs away is quite an effortless task. The unique feature presents itself in the form of the excellent replaceable silicone equipped nozzles. These allow tons of flexibility to take over the experience. On top of that, there’s the conical-shaped tip as well. And what it does is seal the nostril while also preventing dripping. Another thing that you should know about the nozzle is that it fits right into your nostril perfectly. Pouring the liquid through this opening is quite an easy undertaking. Given that the nozzle also acts like an optimal, comfortable nostril seal. The product is dishwasher-friendly, so you can place it in there every time you wish to clean it thoroughly. But the most useful quality is the remarkable spill-defying outlet. The manufacturer has designed it in such a way so as to prevent unnecessary content spill during application. So if this doesn’t account as easy usability, then what does! If you’re not interested in buying a conventional model, then you should opt for the Nasopure Nicer Neti Pot. It’s the best neti pot in a bottle design. And it offers an advantage over the other models currently available. The fact that the thing is able to reach the most congested part of the sinus area in the nasal passage does make a huge impact. And that too without a lot of fuss! It goes without saying that using this particular product is not the same as using a traditional one. The first noteworthy difference is the design. The Nasopure creation is a squeeze-type bottle that you apply to the nostrils in a standing position. The saline solution pressure helps in deep-cleansing your nostrils. And in my opinion, this action is comparatively less messy when compared to the traditional version. You’ll also be glad to know that it can contain 8 ounces of liquid. Keeping the tiny appliance clean is also quite effortless. The most convincing part is that it takes away harmful allergens and bacteria around your nasal opening in the most comfortable manner. Himalayan Institute has done an excellent job at manufacturing the most reliable, complete sinus cleansing system. The Himalayan Chandra Neti Pot cleans the sinuses while also reducing the ill-effects of flu, cold, and allergies. Upon first glance, you’ll notice the distinctive shape of the vessel. This particular design structure makes way for the liquid to flow at an optimal rate. And that means usability is a factor you don’t need to worry about. Then comes the lead-free glaze and ceramic materials used for construction. So leave no room for doubt when it comes to safety as well. The starter kit includes a 10-ounce jar and 2-ounce bottle along with the normal salt packets. Such a product is ideal for those who indulge in nasal cleansing on a daily basis. As for the results, the useful kettle-shaped tool removes dust, mucus, pollen, and other allergens from the sinus passage. And it doesn’t even take a long time to perform this primary function. You can expect quick relief when dealing with Himalayan Institute products. If you’re looking for one of the highest rated options, you’re in the right place. 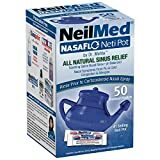 The NeilMed NasaFlo Unbreakable Neti Pot does surprise you in many ways. The medication-free method that it provides to relieve your congested nasal passage is the most effective. As the product title suggests, the vessel is unbreakable. Despite such a solid structure, it has a lightweight design. Plus, it holds generous amounts of water. So carrying and using it are hassle-free undertakings. What’s more is that this complete sinus cleansing system features a specially crafted spout. The component fits into your nostril to send water traveling through the nasal passage quite comfortably. And this soothes and cleans your passage without making a mess. All it takes is a few minutes for the dust, allergens, or mucus to get eliminated from where they don’t belong. So no more popping pills and waiting for them to make an impact. This option is not only medication-free but also powerful enough to give you instant, thorough relief. So there’s no reason why you shouldn’t consider buying such a phenomenal product. There’s nothing more powerful than the Ancient Secrets Ceramic Nasal Cleansing Pot when it comes to clearing sinus infections. It also works well against flu, cold, and allergy symptoms. The unique design makes way for easy usability. So flushing away mucus, dust, and other allergens that leave your nose feeling congested and miserable is not a pipe dream anymore. Especially during allergy and flu seasons! Furthermore, the high-quality material used for construction is ceramic, topped with a shiny glaze finish. This takes care of physical appeal and durability. Next in line is the long shape of the invaluable spout. It’s the part that matters the most, right? The spout has the ability to fit in your nostril in an incredibly comfortable manner. What about the pouring action? The saline solution travels out of the spout into your nasal passage to eliminate all allergens, dust, and mucus. And isn’t that the primary function of every best neti pot? Here’s another remarkable design advantage that Ancient Secrets provides with this particular pick. The ceramic contains zero lead content and the glaze finish consists of food-grade properties. Both characteristics combine to offer a vessel that’s the safest to use for your sensitive nasal passage. The neti pot vessel is nothing but a simple form of nasal irrigation therapy. The kind that doesn’t involve the use of medication! And the best ones on the current market are designed using a variety of materials. These include stainless steel, copper, ceramic, and plastic. Each material comes with its own pros and cons. But, without the shadow of a doubt, we found stainless steel to rank the highest in terms of durability. And copper being the least favorite! Every model we tested features a long enough spout. And the vessel looks like the smaller version of a teapot. Filling them up with saline solution and pouring this liquid into the nasal passage were easy, mess-free tasks. The liquid passes down to flush out excess allergens, mucus, and other unwanted particles. And we didn’t come across any major problems during this process. Performing such an action was not only easy but comfortable and convenient too. All the products discussed come with saline packets that you can mix with warm water. There are a few manufacturers that also include additional accessories. Such an extra neti bottle for complete daily cleansing or storage bag for portability! So you can rest assured knowing that the cleansing systems reviewed here are among the top-rated options. And most of them are recommended by health and medical professionals. Q. What are the health benefits of using a neti pot? A. A neti pot is designed to soothe the facial muscles as well as for upper respiratory conditions. This vessel has its advantages to reduce chronic sinusitis and nasal irrigation discomfort. According to a recent study, both acute and chronic upper respiratory conditions often cause reduced quality of life while increasing expenditure on medical bills. With the help of Saline Nasal Irrigation therapy, a neti pot helps relieve symptoms of chronic rhinosinusitis. Similarly, neti pot is also good for treating viral upper respiratory tract infection. The evidence gathered from 2 conclusive studies reported that the duration of the severity of patients with viral upper respiratory tract infection showed improved resistance and symptoms recovery faster with the help of liquid saline nasal irrigation, which is effectively carried out with a neti pot. It also improved nasal volume, mucociliary transit time, and other symptoms related to nasal congestion. Other proven indications of a neti pot as an effective liquid saline nasal irrigation vessel are reduction of mild to moderate-level rhinitis during pregnancy. Also for post-operative care for patients with endoscopic sinus surgeries. 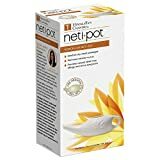 The best neti pot also offers advantages for nasal and sinus relief from environmental pollutants, allergens, and other irritants. Many people with a sinus problem often experience congestion, obstruction, and sneezing as a result of such irritants. So using this vessel during such discomfort is necessary. It brings nasal relief from all sinus symptoms without the use of other western medication. So you can say that a neti pot is probably the best Ayurvedic treatment for sinus conditions. Q. How does a neti pot work? A. You need a good biological explanation for how the best neti pot works for most people. 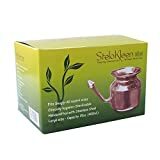 This nasal irrigation vessel comes with a small spout, which is generally made of up human-friendly materials such as ceramic, copper, stainless steel, or copper. Gravity has a lot to do with the functioning of a neti pot. For example, with a neti pot in your hand, you must tilt your head to one side and place the spout up your nostril and pour gently. It has an effect on the nostril’s minute hair follicles called cilia. Cilia have a distinctive hair-like structure which line inside the nasal cavity. Some also line up inside the sinus cavity. The primary function of these hair-like structures is to push back mucus either toward the back of the throat or toward the nose to be excreted out. With the help of a good saline solution, a neti pot is able to increase the speed and coordination of the cilia. This helps remove environmental pollutants, allergens, and other toxic elements from the nasal and sinus cavities. Q. What’s the best way to use a neti pot? A. Even though there exists no medical way to use a neti pot, most manufacturers come with a simple and defined manual for clear instructions. You can even consult with an ENT specialist to talk about the best saline nasal irrigation method for you. However, here’s a common run-down of using this efficient and effective vessel for treating upper respiratory conditions. You must first combine 1 pint of lukewarm water either distilled or boiled with a tsp of salt in the neti pot. If you wish to make the solution more gentle, you can add some baking soda as buffer. Fill the water and salt (or baking soda) to the top of the neti pot. Then angle your head to the side, at a 45-degree angle- and pour the solution into your nostril. The liquid will flow through your nasal cavity toward the other nostril. If the liquid runs out of your throat, kindly spit it out. The best time to use a neti pot, based on research, is about 2-3 times a week. However, if you daily suffer from sinus allergies, using it once a day is essential. Q. Is this safe for children? A. A neti pot is completely safe for children use. Regular use of this vessel helps keep your child’s nasal and sinus cavity clear of any residue allergens or environmental toxins. Children, often exposed to the environment, may develop quick respiratory sensitivities that stay with them for their lifetime. So keeping their upper respiratory system clear of allergies, infections, or any discomfort is essential. It’s important to know that you will find a kid’s neti pot slightly different than an adult’s. This is because size of the vessel as well as the pout is smaller. A kid’s neti pot is shaped in a such a way as to make it look fun and exciting for your child. So it’s time to take that plunge and decide what suits your needs and preferences the most. After taking all important factors into account, it’s the Aromatic Salt Premium Ceramic Neti Pot that emerges as the top pick. Let’s find out why for the last time! When using a cleansing system like this, it’s important to keep it hygienic and clean. In that aspect, there’s nothing to worry about as the design offers tons of ease and comfort. The shape of the spout is smooth and tapered. As a result of which it fits in your nostril without any discomfort. Even the handle is well-built to provide thorough, complete cleaning. And additional benefits that come in the form of dishwasher-friendly, lead-free properties are also quite impressive. With no lead content, the safety factor gets highlighted. So you’re looking at a lightweight, durable tool that has the ability to do something that pills and other medication are created to accomplish. And that too without any side effects!